There appears to be a big disconnect throughout the industry between emergency shower and eyewash products that comply in a lab environment and how they perform ‘in the field’. Adelle King reports. Despite emergency shower and eyewash equipment being regular fixtures in the plumbing industry, these products are in a ‘black hole’ in terms of certification, with a disconnect between operation requirements and product design when it comes to their installation in commercial and industrial facilities. As a result, RBA Group development manager Tim Fisher says there are a number of non-compliant products out there that do not function as intended even though they comply in a lab environment. Despite this, Tim, who is also the former Standards Australia committee chairman of SF-048 Emergency Shower and Eye/Eye Face Wash, says there is very little information available concerning these non-compliant products. There is also a lot of confusion around which regulator has jurisdiction over the installations. 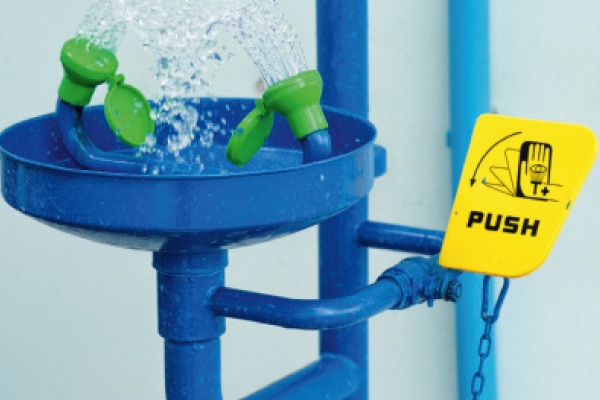 Although many emergency shower and eyewash systems are plumbed to mains water supplies and installed by plumbers, they are not considered plumbing products and there is no reference to a need for compliance under the Plumbing Code of Australia (PCA). A risk assessment Tim undertook on the subject found that at least 50% of installations are undertaken outside of the jurisdictions of the PCA and plumbing regulators, and into the jurisdictions of the departments controlling mines or self-regulated for offshore applications. Additionally, the Australian Standard covering emergency shower and eyewash equipment, AS 4775-2007 Emergency eyewash and shower equipment, is referred to in legislation that covers numerous jurisdictions, including WH&S codes. However, for the installations that do fall within the jurisdiction of plumbing regulators and are connected to water mains supply, there is a concern among plumbers that these systems do constitute a plumbing product and should be carrying a WaterMark certification for them to be able to be legally installed. This would require emergency shower and eyewash equipment to be referenced in AS/NZS 3500:2013 (parts 0-5) Plumbing and drainage set. “This needs to happen given the critical hydraulic design elements required for installation where flow rates exceed 90L/min on single combination showers, with some brands requiring up to 120L/min per fixture,” says Tim. There are also other issues that have arisen with the installation of these systems, stemming from a conflict between operation requirements and product design. Under AS 4775-2007, emergency shower and eyewash systems require tepid flushing fluid with an optimum temperature range between 15.6°C and 37.8°C. “To be able to get those temperatures, there is the need for thermostatic control of the water temperature,” says Tim. “That then leads us into issues surrounding water temperatures for direct dilution, which are referenced in AS 3500:2013. It also brings us into the area of product standards around thermostatic mixing valves because there are very specific requirements around thermostatics and the delivery of heated water for emergency showers. There also appears to be a lack of understanding among some system designers and installers concerning the mandatory need for simultaneous operation of combination emergency showers and the hydraulic design requirements needed to make them function if connected to a water supply. “I’ve seen a number of sites where the main tapping is 25mm but there are four emergency showers installed in a building fed from that water meter. This means that even though the system appears compliant, it cannot meet the simultaneous performance requirements of AS 4775-2007,” says Tim. Finally, there are no design parameters around the capture and disposal of contaminated water for these systems, despite the fact that when these systems are operated there is a high likelihood that the water being drained is contaminated, albeit with significant dilution. Yet it’s not as if these systems have been flying under the radar. Many of the products on the market have third-party, independent certification and have undertaken additional tests with respect to materials in contact with drinking water under AS 4020:2005 Testing of products for use in contact with drinking water. They also undergo weekly verification and annual testing. “Emergency showers and eyewash equipment are the most regulated products beyond any requirement of any existing WaterMarked product,” says Tim. So how does the industry resolve the issues of confusing regulatory jurisdictions and disconnect between requirements and performance? Tim says there is no easy answer but that there does need to be more focus on the myriad of components that may be required for installation. Tim therefore disagrees with the idea of requiring these systems to undertake WaterMark certification and says the risk assessment he undertook found there was no perceived risk that could justify it. “WaterMark does not guarantee that a product is fit for purpose and emergency showers and eyewash equipment is already required to have third-party certification to the Standard. If we apply WaterMark to the shower and eyewash assemblies then all associated products would also require certification. Given that the majority of these are not manufactured in Australia and/or have no technical specification for product certification to be assessed against, these documents would have to be created. Rather, he proposes the issue be approached from a design perspective to take a much broader look at the overall system. This wouldn’t solve the issue of whether emergency shower and eyewash systems should be captured under plumbing regulations though. “There are arguments to both sides here,” says Tim. For instance, an emergency shower and eyewash system that costs $1,500 requires a heated water system that costs approximately $10,000, according to Tim. A group has now been formed to conduct a formal risk assessment about whether products require recognition under the PCA both in regards to installation and WaterMark product standards certification. Tim is part of this group and says they are intending to complete work by the end of the year. “This is not about simply placing another mark on a product.